Boston — Feb 10, 2017 — This year, instead of heading out to a restaurant why not stay home and treat your lover to a steamy, sizzling Valentine’s Day lobster Day dinner with live Maine lobster, oysters, and award winning seafood chowders all delivered fresh and delicious right to your door. That’s right. You can have the live lobsters delivered directly from our docks right to your door anywhere in the United States. With all the best seafood New England has to offer, Lobsters-Online can provide all the ingredients for a decadently scrumptious romantic dinner for two. From oysters to lobster tails, there is plenty to choose from. Cupid knows nothing is more romantic than preparing a wonderful live lobster dinner steamed to perfection and served with plenty of butter. 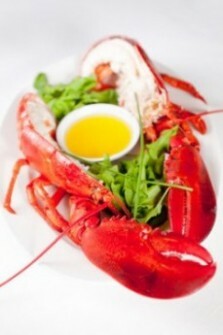 Lobsters-Online.Com features plenty of helpful recipes to make cooking fun. Cupid recommends starting with a tray of world famous Wellfleet oysters plucked from the cold waters off Cape Cod. Pop them open and serve with our specially prepared cocktail sauce. Next share our home style Lobster Trap Co. lobster bisque made with real chunks of lobster. Steam or bake the lobster – the bigger the better. Or if you prefer, order a tray of jumbo lobster’s tails that come ready to cook and serve. Also popular this year is surf and turf packages that boast Montana free range beef filet, Maine lobster tails and creamy smooth clam chowder. The package comes with a complete lobster bib and steel cracker kit to make eating easy. So while everyone else is fighting for reservations, trying to park, waiting for their table and getting rushed by the waiter, just say “No.” Instead, treat your lover to a Valentine dinner at home with a love fest of the best lobster and oysters in the world. Cupid will be proud. And don’t forget, a lobster dinner makes a memorable Valentine’s Day gift for everyone in the family. All our lobsters are right off the boat, on to the dock and into our giant, new facilities. Since we sell direct, no other online service can match Lobsters-Online for freshness, quality and price. Because we ship with FedEx, you can order online and enjoy beautiful, select grade lobster the very next day. For more than 42 years, the Lobster Trap Company has been delighting customers from Boston and Cape Cod to as far away as Hawaii with its quality seafood. With facilities in Maine and Cape Cod, the Lobster Trap Company continues to offer its online customers the highest quality and lowest price found anywhere. Just in time Maine lobster rolls for your Super Bowl 50 Party, a traditional New England lobster roll recipe sure to please. Yes, the very same lobster roll that you can experience in any of the numerous lobster shacks and seafood restaurants that inhabit the New England coast line. Nothing is better than the pure, sweet taste of lobster bursting out of a toasted New England style bun. So whichever team you are cheering for … serve up to your guests some lobster! Before you get started, please note there are a couple of tricks if you want authenticity. You must use fresh, live Maine lobster or freshly cooked Maine lobster meat (tails, claws and legs). And if at all possible, make sure you use New England style split top hot dog buns (with the cut sides) as the roll’s flavor explodes when toasted on a grill or skillet. Alternatively you may buy freshly cooked lobster meat and skip cooking the live lobster. It’s a time saver and if the lobster meat is freshly cooked, the results will be the same delicious Super Bowl lobster roll bursting with flavor. Whether you are fans of either team, your Super Bowl 50 guests will love you. Bourne, MA — A rare calico lobster was spotted among the lobster tanks at the Lobster Trap Company facility at Cape Cod. One in about 25 million, it is a very rare find. They are not sure where it came from as it was mixed in with a large delivery. Because of its spotted coloring, it was easy to see among the dozens of other live lobster floating around in the tank. The typical lobster is colored a muddy brown with hints of red, which is the perfect color for hiding from predators. Other rare colored lobsters such as calico, blue, yellow or green usually do not last long as they are easily spotted by predators on the bottom of the ocean. We invite you to tell us what you think and post a Lobsters Online review to our Lobster Fly Blog so your comments may be shared. Why not give it a try? Founded in 1997, Lobsters-Online.Com has served thousands and thousands of satisfied customers. Many of our customers order from us two or three times a year. It is because of you, our loyal customers that we have continued to grow each and every year providing millions of pounds of lobster and seafood to a hungry crowd. We thank you for your business over the years and we welcome you to review your experiences. We love hearing from our customers about how their dinner guests enjoyed the lobster or how surprised Mom or Dad were to receive a lobster dinner gift. We especially enjoy hearing about how Lobsters-Online made the holidays more fun, including Thanksgiving, Christmas, New Years, Valentine’s Day, Mother’s Day and Father’s Day. We also have learned over the years how our customers celebrate during the summer holidays of Memorial Day, July 4th and Labor Day with all the makings for a great lobster clambake. And having live Maine lobster delivered to a favorite vacation spot has become another popular customer tradition. We welcome you to share an idea, provide a review of our service or tell us if you tried one of our lobster recipes and liked it. Or just share with us if you have recommended Lobsters-Online.Com to a friend, co-worker or relative. You may also want to go social and Like us on our Facebook page. We’d like that, too! Lobsters-Online is operated by the Lobster Trap Company which is headquartered on Cape Cod and operates facilities in Machiasport and Steuben, Maine. The company is a proud member of the Maine Lobster Institute. The company is also a supporter of the National Fisheries Institute and is a long-time supporter of the U.S. Coast Guard Fisheries Training Center. With New England and New York in the Super Bowl for 2012, it is only fitting that everyone’s favorite East Coast fare be part of the super celebration. Yes, we are talking about lobster; lots of fresh, great tasting Maine lobster for a Super Bowl lobster dinner. Saturday delivery of live lobster is now available in most parts of the country. So even if you are sitting out there in Kansas, you can still be part of the New England lead up. Order the lobster online and have them delivered right to your house. Live Maine lobster can now be part of Super Bowl celebrations all across the country. After all, how often do the New England Patriots and the New York Football Giants play one another in the Super Bowl? Yes, with this second time around, the New York–Boston rivalry is alive and well. So why not celebrate this East Coast championship match by ordering the New England eight-lobster special. When the lobster arrives on Saturday, you may keep them overnight by adding some wet newspapers and frozen gel packs to the carton. Don’t take them out of the carton to play with. It is important they stay cool and moist until ready to cook. If it’s below freezing outside, don’t leave the lobster in the box outside either. Cook for 12 to 13 minutes until bright red (do not over cook as meat will toughen). Give the antenna on one of the lobsters a yank. If it pulls off easily, the lobsters are done. Remove the cooked lobster and allow to drain for one minute. Eating the lobster begins by twisting off the claws and the tail and cracking the shell to get at the meat. Providing your guests with traditional lobster bib kits makes the job easy; the the kits come with handy eating instructions. To round out your lobster dinner, consider adding some traditional prepared lobster fare like a Maine lobster pizza or fresh steamer clams and oysters. Cape Cod, Mass. (Oct. 5, 2011) – The Lobster Trap Company & Lobsters-Online.Com today announced the anniversary of its 14th year of selling live lobster with overnight delivery to retail customers all across the United States, making it the oldest Lobster web site in continuous operation. Launched in 1997, the retail lobster web site became an instant success with its first live-lobster sale coming from a Florida retiree who had recently moved to Tampa from Connecticut and was missing New England lobster. The Lobsters-Online web site today. Designed and built by founder Wayne Howe of Boston, the web site was developed originally as a prototype to show off a new e-commerce system and to encourage seafood wholesale vendors to move their 1-800 telephone order business onto the web. Howe was hoping to encourage the seafood outlets to employ the e-commerce system Howe was selling. Faced with resistance from the wholesalers, who rebuffed his efforts with expressions such as — “Web, what web? We are fishermen. We don’t know anything about the Internet.” — Howe decided to take the prototype and use it to create a web based retail seafood business. Contracting with seafood suppliers, Lobsters-Online.com went live with the click of a mouse. And within minutes, orders began arriving. Sales grew steadily until the millennium, when orders came in so fast and so strong during December that it doubled sales for the entire year. “We have thousands and thousands of satisfied customers who buy from us every year,” Howe said. Lobsters-Online.Com has served hundreds of thousands of customers and has shipped millions of dollars worth of lobster and seafood. Sales have increased an average of 25 percent per year since the year 2000. Logan Clark, CEO of the LobsterTrap Company, headquartered in Bourne, Massachusetts on Cape Cod, formed the partnership with Lobsters-Online in 2001. The 35-year-old Lobster Trap Company is among the largest seafood wholesalers in the country and it boasts sparkling, brand new plant facilities capable of storing thousands of pounds of lobster in seawater tanks. Today the Lobster Trap Company boasts its own lobster boat docks and facilities in Machiasport, ME; Steuben, ME; and Cape Cod. This ensures that all Lobsters-Online.Com lobsters are fresh off the boats, onto the docks and into the Lobster Trap Company facilities. There are no middlemen to drive up the price or delay shipping. Lobster Trap Company trucks loading at Cape Cod facility. Featuring all the best seafood New England has to offer – including hard to find jumbo lobster — the Lobsters-Online.Com web site is open 24 hours a day with fresh live lobster available year round. Customers that order by 2:30 p.m. EST can receive their lobsters the very next day. Deliveries are available Tuesday through Saturday.